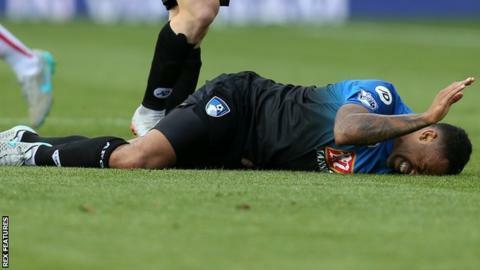 Bournemouth striker Callum Wilson says he is "on course" in his recovery from a long-term knee injury. Wilson, 23, completed an outdoor training session on Tuesday, his first since rupturing his anterior cruciate ligament against Stoke on 26 September. He was the Cherries' top scorer last season with 23 goals as they were promoted to the Premier League. "Getting outside's a great milestone in my rehab so hopefully there's no reaction," he told BBC Radio Solent. Wilson was ruled out for at least six months following an operation on the injury. He is continuing his recovery alongside striker Max Gradel and defender Tyrone Mings, who also sustained serious knee ligament injuries, in the club's 1-1 draw with Leicester City on 29 August. "The surgeon told me six to nine months," Wilson added. "I'm three and a half months in already and I'm back running, so I'd say I'm on time. "I'm not trying to rush anything, I wouldn't want to hamper anything in the long term. I'm ticking off each milestone as I go." Wilson's absence has seen Bournemouth bring in strikers Benik Afobe and Lewis Grabban in the current transfer window as cover.